btw... The kitty quilt up top with the greens and purples and teals is going to a Bengal kitty fambly. Won't they look stunningly gorgeous on it? And Daisy, the answer the question you asked about two weeks ago is... 42. Mom planted these in dirt today. She says they are Pansies. Pansies, shmanzies, they aren't 'Nip! I want NIP! So's Christmas. I want Nip. Iron the kitty quilt top so it is nice and flat and doesn't have any wrinkles, then lay it out on a worktable, wrong side up. Mom uses nice, soft warm fleece for the middle of the kitty quilt sandwich. She gets light gray colored fleece because she doesn't want it showing through light colored fabrics. Cut the fleece just a little bigger than the kitty quilt. Mom uses a big square of cardboard as a template, as seen here. She draws around it in pencil, then cuts on the line. Place the fleece middle on top of the kitty quilt, making sure the kitty quilt is completely covered by the fleece all around. Now you have to iron the fabric that will be the back of the kitty quilt. 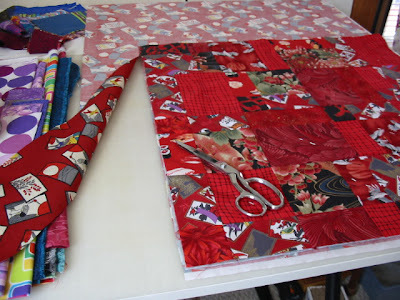 When the backing fabric is all nice and flat, place it on top the the kitty quilt top and filling, making sure the filling is covered on all sides. Holding all layers together in each corner, flip the kitty quilt sandwich over, so the top faces up. Flatten out any wrinkles or bumpy areas, and pin the layers together, placing pins about 6" apart. Trim the excess fabric around all 4 sides, cutting the backing about 1/2 " larger than the kitty quilt. Next step -- quilting your kitty quilt! Could you make a doggie quilt? Just make a quilt big enough for your dog. Today is the Keep Our Pets Safe march. Mom's brain may not be working on all pistons (whatever that means), but mine is! She was going through some pictures to find some really nice ones of Gizzy and she found this. Yup! Jasmine as a tiny kitty. Jasmine as a fruitbat. Who knew? Lookit! Mia named me Female Feline today! Mom says she feels just like Jasmine does in this picture, taken last night. Mom says she can't seem to do much thinking. She says doesn't seem to be doing much doing either. I'm only a cat, but I know she's usually thinking and doing all the time, so it sounds like she feels a little lost. Dragonheart honored us with the Thinking Blog meme, but we're gonna do it later. Thinking just seems a bit too hard for all us "girls" right now. Mom has started calling us "the Girls." But Ha Ha Ha! 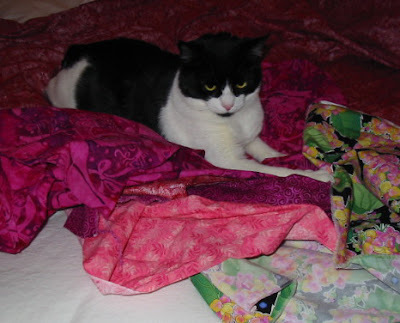 Lookit me on the bed surrounded by all this PINK fabric. Guess who that's for? It's a secret, I can't tell. Three more Gizzy Quilts went flying out of here today. 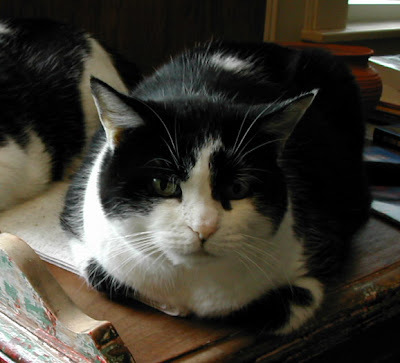 Marycatland, Pennsylvanicat and Indianacat. Dragonheart received his, and six just landed in New Zealand. 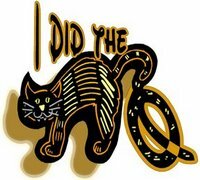 Those Kiwi cats don't have blogs. And English Daisy should get hers soon. 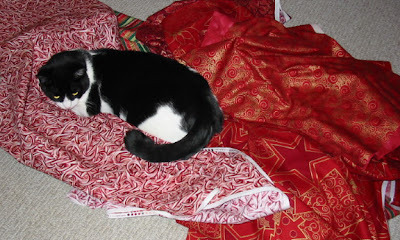 Mom's going to continue making quilts as long as cats want them. She loves sewing the quilts. Everybody wants to know how we're doing. Mom says, "Well, Jasmine thinks Millie is really annoying. Millie wants some attention and she's trying to get it from Jasmine, who just wants her to go away. They're just like sisters." I think Mom expected more drama and histrionics when Gizzy went to the Bridge. She's making sure we both get lots of love and attention. Because of the gluten thing, we're not getting any Temptations at all. That and Mr Karate thought I was a little fat when he saw me the other night. (Ouch!) When we were trying to get Gizzy to eat, it was snacks and treats and extra food all over the place. Not anymore. Mom wants all us "girls" to start eating better. I'm confused. Eating "better" means eating less? * a "gizzy" is a S.U.O.C.M. - Standard Unit of Cat Measurement. One gizzy is approximately 18" long. This is the birthday boy today! 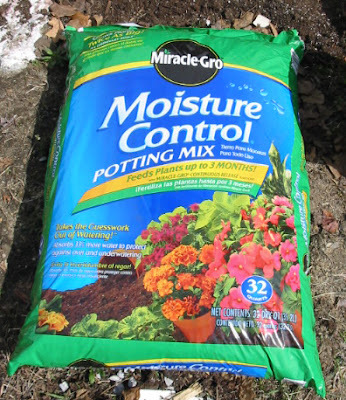 So she gets all this dirt and food home and what does she do? She puts the FOOD in the DIRT! Now I know she's been all stressed about Gizzy lately, and I know we've all been sad, but I really am beginning to wonder if the poor woman has lost her mind. In these pots are Oregano, Thyme (time? ), Sage, Lavender and Pineapple Mint (hey, don't ask me, I don't get it either). In the back there are Chives, but they are from last year. Here are two pots of flat leaf Parsley and some Cilantro. and this is spinach, YECH! Mom put the cat grass in a pot of dirt, too, but I don't think it liked it. I was promised 'Nip. I'm not seein' any 'Nip. I'm going to have to do something about that. Mom, Jasmine and I want to say a profound Thank You to all the cats and their beans in the blogosphere who offered their condolences when Gizzy went to the Bridge. The sheer number of comments left us and our extended bean family completely stunned. Many of them were so heartfelt we were brought to tears over and over again. 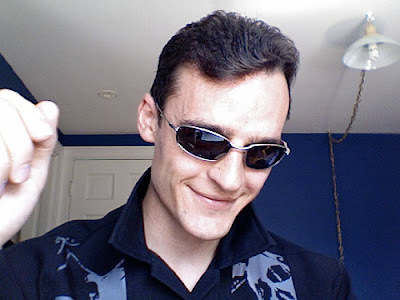 We also want to thank those who posted special tributes to Gizzy: Kimo & Sabi, the Crew, Abby, Bubbles, Mrs B & Madness, Monte Q, Willow, The M's, Meezer Tails, Skeezix, Beau, Mr Zenith, Rocky and DKM and Sanjee on the Cat Blogosphere. If there are others we missed, please accept our apologies, it has all been quite overwhelming. It has been very heartwarming as well. 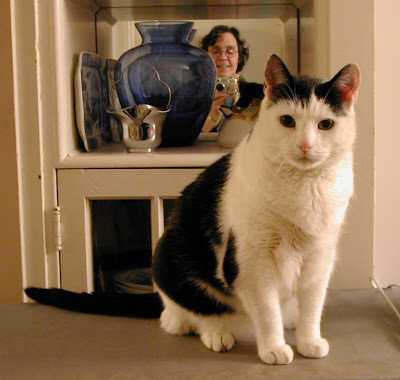 Our loss has been soothed by the enormous outpouring of love and affection by others who understand how a cat can become an important and integral part of a family. We want to remember Gizzy when he was healthy and happy, not when he was thin and weak. 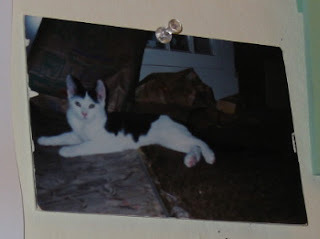 To that end, Mom, Jasmine and I want to share this picture of Gizzy, taken when he was about 10 years old. 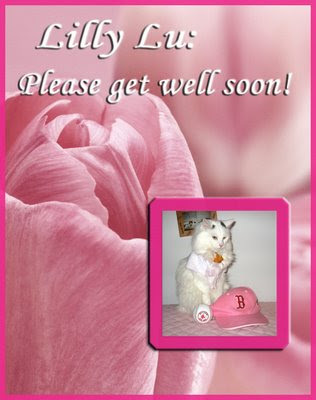 Lilly Lu: Get Well Soon! Jasmine and I are rooting for Lilly Lu to get better real soon! Gizzy went to the Rainbow Bridge this afternoon. He had to be helped. The vet said he was probably down to 5 pounds. She also felt a tumor that was not there 2 months ago. 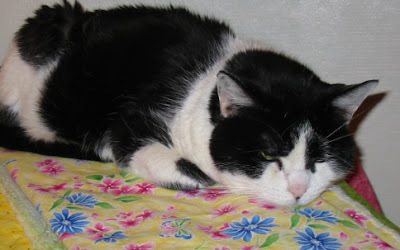 Gizzy had intestinal cancer. 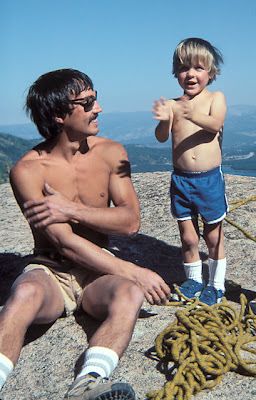 This is probably Mom's all-time favorite picture of him. It hangs on the wall of her office at her day-hunting place, right next to a few pictures of Mr Karate. He was a little over 1 year old when it was taken. There are lots of leaky eyes here. It's gonna be really lonely for me without him. We're going to be off-line for a few days. This is the sewing room. I thought you'd like to see where all the kitty quilt magic happens. Here you can see the worktable and big board. Pinned to the board on the left of the table is The List. Each kitty quilt order gets a page. These pages are clipped to the board in categories... Top Made; In Process; Ready to Ship; Waiting for $$. Mom keeps a running tally of how many quilts have flown the coop and how many are waiting to hatch. Below "The List" Mom hangs the plastic envelopes with quilt pieces. On the floor next to the worktable are a stack of plastic bins. In these bins Mom has fabric "chunks" sorted by color. 75% of the time, Mom can put together a kitty quilt using the chunks she has already made. 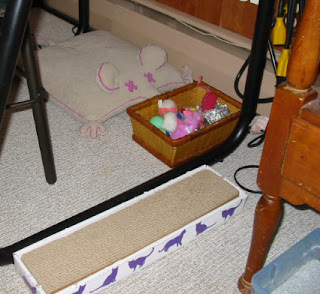 Under the worktable is the Eye-key-ah conked-out mouse cushion, a basket of toys, scratching pad and a litter box. All for me. This is the work table, where Mom cuts the fabric into strips. This stack of fabric on the left has been pressed and is ready to cut. 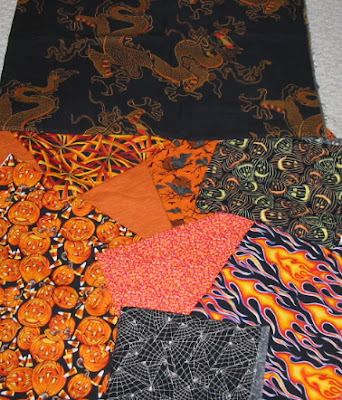 The stack of fabric on the upper right has been washed and must be ironed before it can be cut. The tissue box is self-explanatory, but the other little box is used as a table top trash bin for bits of fabric, thread and bent pins. 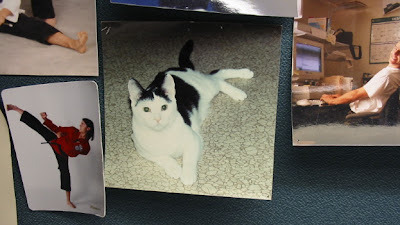 On the wall above the worktable, Mom pins notes from cats who have ordered quilts, or just sent us cards to say Hi. To the right 0f the work table is the sewing machine. Mom's sewing machine is 30 years old, and doesn't do anything fancy. Inside the old student's desk is a small basket with empty bobbins and replacement sewing machine needles and a pair of scissors she uses to trim threads. There's a wastebasket to her right. At her feet, under the desk is a clear plastic bin. 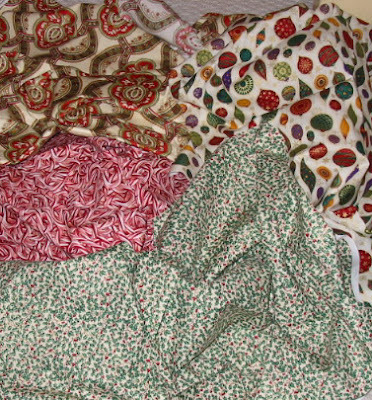 When Mom sews lots of strips or pieces, they fall into the bin instead of onto the floor. On the wall to the right of the sewing machine is the thread rack, which is where Mom keeps her thread, organized by color. Notice there isn't much thread on the bottom three rows. That's because I can reach those. Just to the right of the thread rack is the closet. 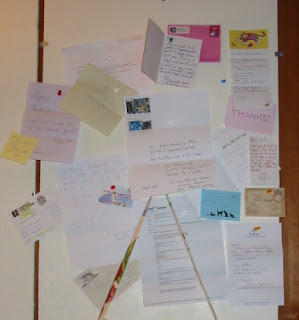 This is a bulletin board on the door where Mom puts pictures of her fambly and other things she likes. It used to be covered with more things, but I pulled the pins out and Mom didn't like that. Inside the closed is this drying rack where Mom stores the strips of fabric she hasn't yet sewn into pairs or cut into chunks. Storing the strips this way means they don't get wrinkled. Next to the closet is this bureau. Mom keeps supplies in the drawers, one of which I will show you in a minute. On top is this small TV, CD player/Radio and a DVD player. Yes, Mom painted the bureau too. In a drawer in the bureau, Mom keeps her good sewing scissors, her rotary cutters and spare blades, her pin tin, seam ripper, measuring tape, binding tape maker and other small tools. Opposite the sewing table is the ironing board. (Mom just got a new pad and cover.) You can see the spray bottle, telephone and the iron as well as some other stuff. Mom says the funnel is real useful for adding water to the steam iron, and the bottle of water is for her when she's thirsty. The Most Important thing in the sewing room is the cat hammock. This window faces South, so it's the best place in the house on a sunny day. See the radiator along the bottom of the wall? That makes the cat hammock a warm spot too. And see that little stool? That's so geezer cats can reach the cat hammock. And every workspace has pictures of those you love.